Since I had some free time in the kitchen today, I decided to get a little crazy trying a complicated recipe that I’d never attempt on a weeknight. Apparently I was making such a mess running around the kitchen manically, Leela was getting a little nervous. 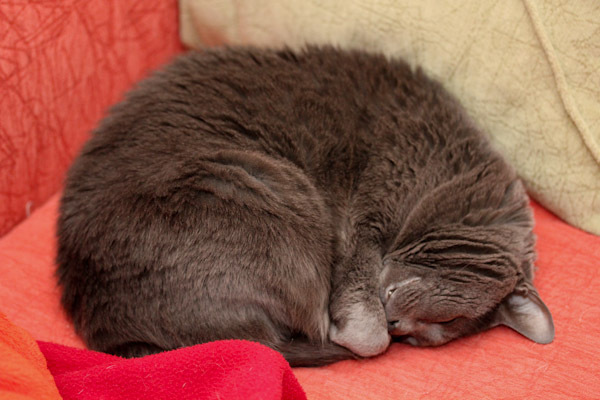 And Smokey, well, was not. Even hubby took one look at the mess I was making and announced he’s picking up a meat-loaded pizza for his dinner. Heh, his loss. When we go out for good Italian food, I usually order a cheese-less pizza, pasta with red sauce, minestrone, etc. for vegan options. I always eyeball gnocchi on the menu even though I won’t order because it’s not vegan. But it looks so good when hubby orders it, these tender little blobs of potato slathered in sauce. I decided I was craving that tonight, but didn’t have regular potatoes, only sweet potatoes from our last farm box. So I challenged myself to turn them into a gnocchi fusion dish making a complete mess of the kitchen in the process and taking a huge gamble since I’ve never attempted to make gnocchi before. The recipe, while messy, came out great merging sweet potatoes, chickpea flour, curry, coconut, and tomatoes. 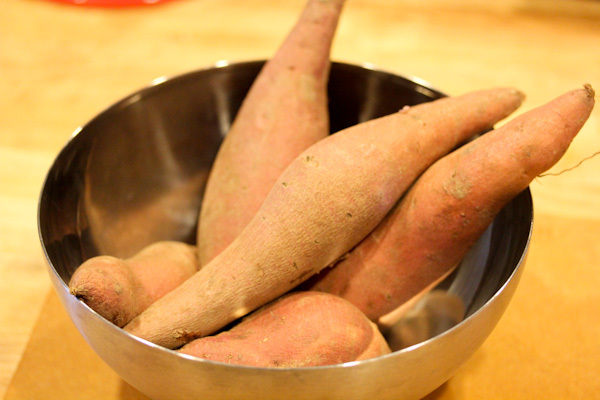 In a large soup pot, bring enough water to a boil to submerge the sweet potatoes. 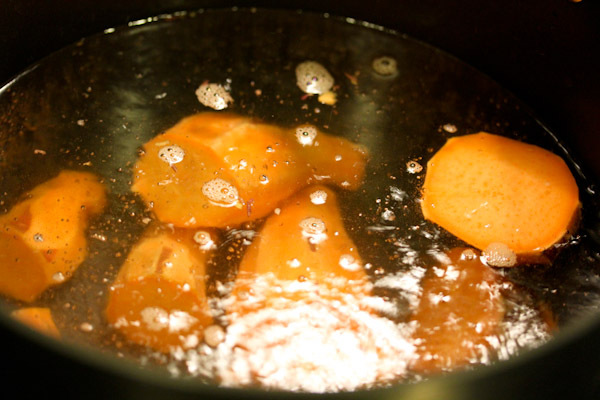 Add sweet potatoes, reduce heat, cover and simmer potatoes for 25-30 minutes, until tender. 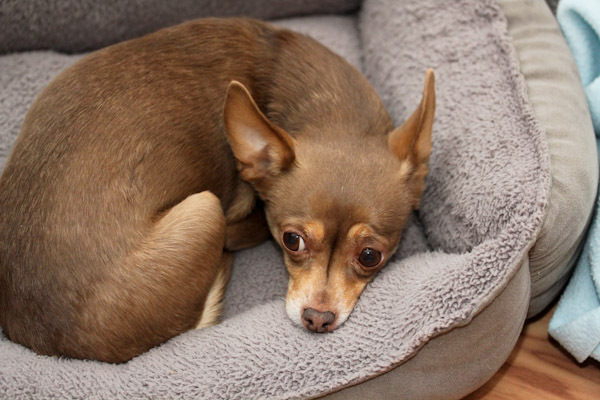 Whisk the ground flax seed and 3 tbsp. of water in a small bowl, then set aside to get gooey together and work as an egg substitute in the gnocchi. 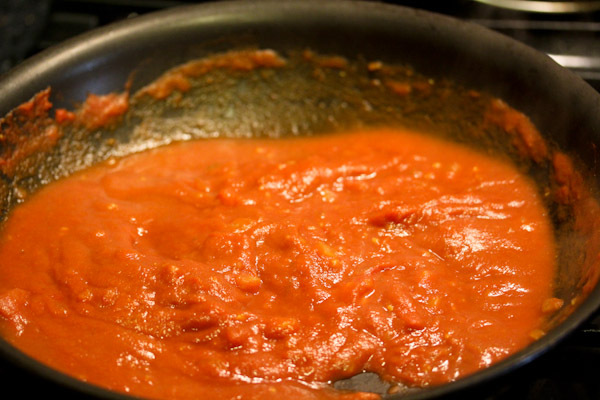 Meanwhile, heat olive oil in a large skillet over medium-high heat for the tomato sauce and add the chopped onions. 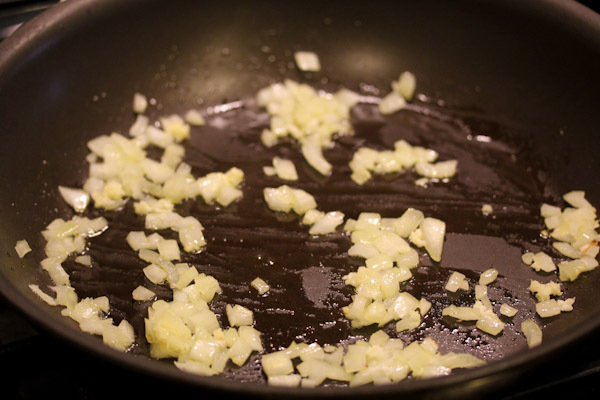 Saute until translucent, then add crushed garlic and saute for another 5 minutes. Stir in the rest of the tomato sauce ingredients and simmer covered over low heat until gnocchi is ready. 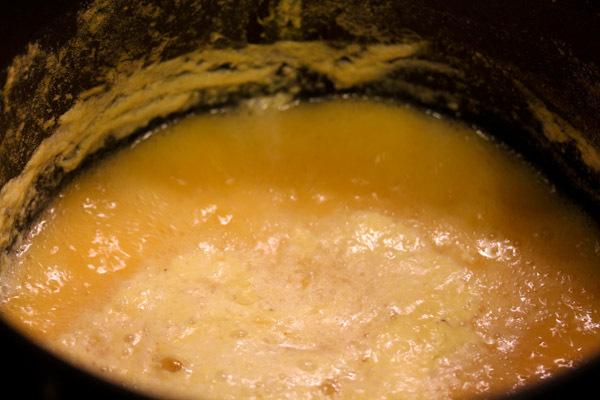 Once potatoes are done, pour into a strainer and refill the soup pot with about 4 inches of water and place over high heat to bring to a boil again. 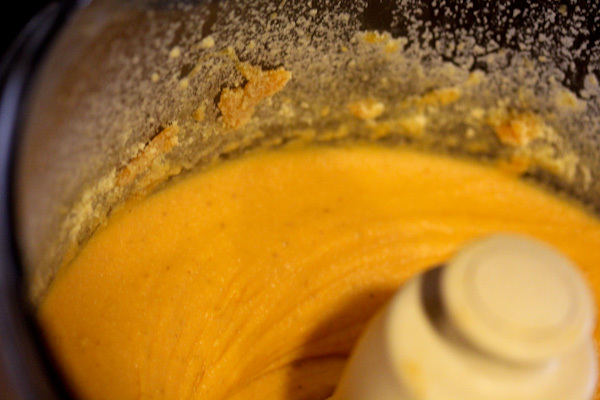 Add potatoes to a food processor and process to a smooth texture. Add the flax seed mixture and the rest of the gnocchi ingredients to the food processor and process until well blended. Drop about ten 1″ spoon fulls of the potato mixture to the boiling water at a time and boil until they float to the top, about 3 minutes. 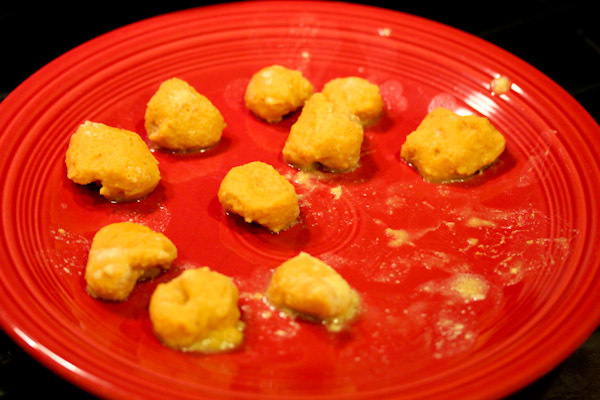 Remove the gnocchi blobs from the water using a slotted spoon and place on a plate, dump off extra water if needed. Repeat until potato mixture is used up. 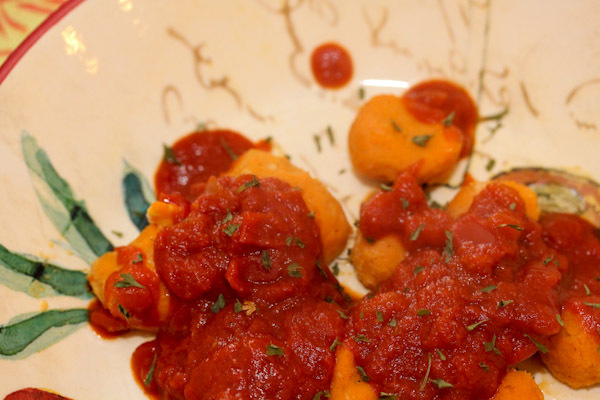 Serve about 5 to 10 of the gnocchi blobs on a plate with the tomato curry sauce drizzled over the top. Makes 4 servings. While the sweet potatoes were boiling, I started the tomato curry sauce to get it simmering while the gnocchi was created. 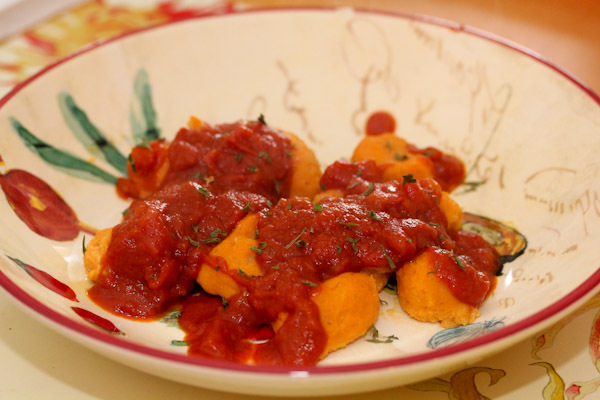 The sweet potato mixture is very light and fluffy in the the food processor, too fluffy to roll like dough as many traditional gnocchi recipes call for. But that’s okay, because it was much easier and faster to just drop spoon full blobs into the boiling water. Luckily the finished product was gorgeous and smelled wonderful with curry, coconut, and tangy tomato aromas flowing from the plate. I guess this dish is American fusion at it’s finest with Indian curry flavors in a Italian-like dish with a little Thai flare, but that’s fun right? Wow this is impressive! you go girl! I LOVE gnocchi, but have never tried to make my own– so intimidating!! Yours look perfect, and I love that you shook up the traditional flavors a bit. Yum! In whichway is this a raw recipe? It’s not, but I’m not 100% raw. I was for awhile when I first went vegan, but have adopted a high-raw, whole foods vegan diet since.